This is the most powerful model series trucks Schmidt. This 2500 kg capacity loader is ideal for construction, handling, storage, forest and agricultural work. In addition to this series of truck can be used for fifteen SCHMIDT attachments. The truck is controlled by three actuators joystick. Hydraulic and four-wheel steering system provides excellent maneuverability. The model has a new type of cab, ensuring a comfortable work. Cab overloaded unnecessary levers or buttons, convenient working conditions of heating and provides a built-in tape-recorder. The last truck has the largest lift capacity in relation to their own weight. Collect Poland truck has not only quality, but also has all the necessary environmental and safety certifications. 2500 kg load capacity of 1 m3 standard bucket and 4TNV98T EURO3 Yanmar 61,3 kW engine provides efficient loader work, so compared to the past with an excavator, it can be seen that the same handling operations will be carried out several times faster. 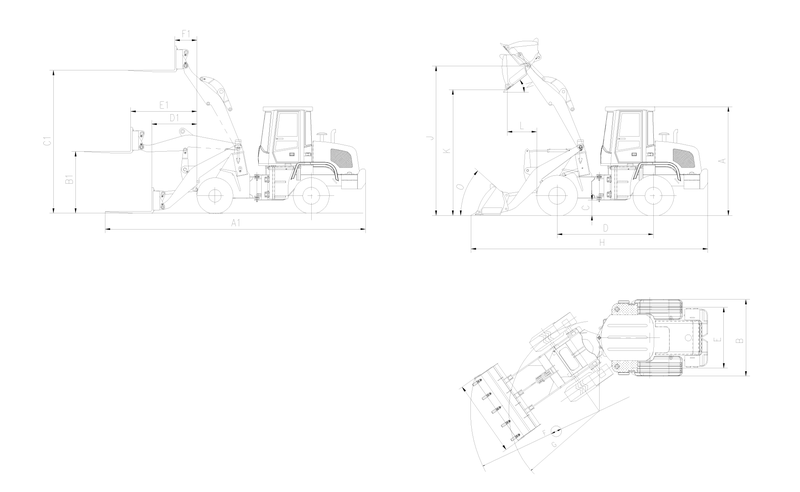 In addition, although being the largest Schmidt, "foster family" 6050 loader is as maneuverable as the smaller "brothers" and according to this indicator is also far ahead of excavator or other cargo transport. Like other trucks Schmidt, 6050 model can be used very widely, but it can be particularly optimized to exploit the construction or in the forest industry, where trucks have to work quite hard conditions the transport of building materials, wood, demolition of buildings or grubbing stumps. On the other hand, under these working conditions - a relatively small space construction sites or forests, where the trees and maneuvering hampered relief nelygimui - highlights the best features of the truck as a flotation and maneuverability and low center of gravity ensures stability when driving on any surface. Another advantage of the model it is 6050 - almost four meters seeks lifting height is sufficient to complete both in the forest industry and the construction of low-rise industrial or residential buildings. In the latter case, the company no longer crane for nearly all building materials and construction may cause wheel loader.